I went with a straightforward Red White & Blue “Americana” theme. Coca-Cola decorations have always been a favorite of mine, and our kitchen is decked out with some vintage crates and bottles, so I took advantage of those. An old Coke crate served to hold the tableware: plates, napkins, cups, straws, and forks. The table had super simple decorations. 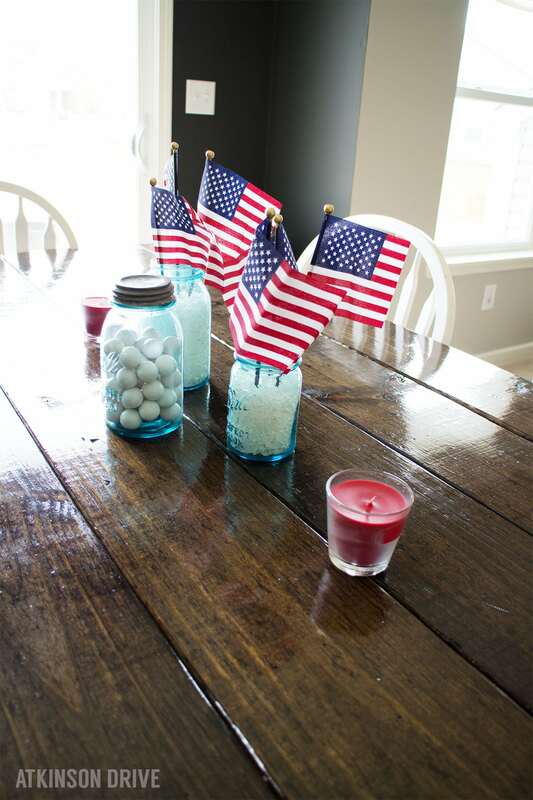 I just filled vintage blue mason jars with vase-filler and some small American flags and white gumballs. And it just so happened that I had some red candles laying around, so I used those to add a little more color. But I really love how the blue mason jars tied in the red white and blue theme! To keep with my vintage / Americana theme I found some fun glass bottle beverages to serve: Mexican Coke, and Jack & Coke. Aren’t they so cute? (I have a thing for glass bottles). To make them a little more exciting, though, I served them in a large vintage crate that I had laying around. When in doubt, I always take advantage of vintage! For the ladies (aka myself), I whipped up a Moscato spritzer! It’s a really tasty recipe. Just fill up about 1/4 of a pitcher with Sprite, add sliced strawberries & blueberries, and top it off with Moscato. My favorite brand is Beviamo Moscato D’Asti – it’s sparkling and so delicious. 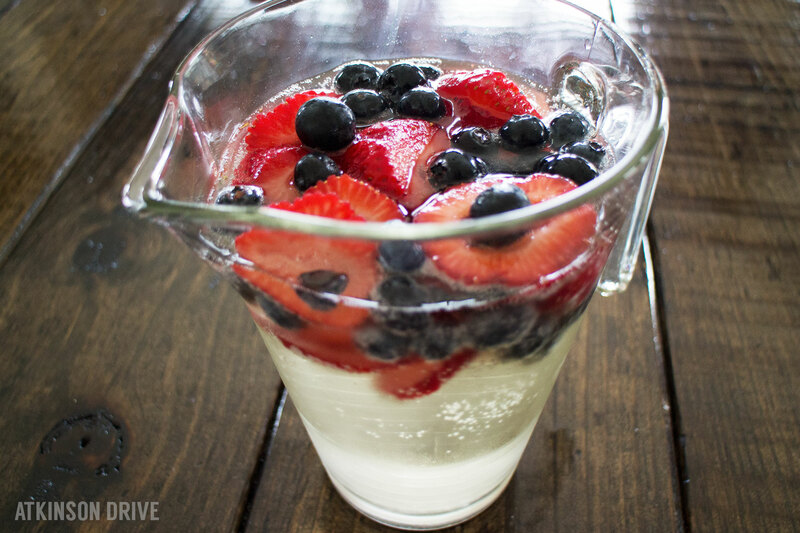 *FYI: The Spritzer-Soaked berries are divine! The menu was a huge hit, and really easy to make! This was my first time preparing or cooking ribs, and I was a little nervous about it, but it went really well and everyone loved them! So, if you haven’t tried it before – you should! You can also check out the BBQ Pitmasters at readysetribs.com for tips on finger-lickin’ ribs. While at Walmart, I picked up two racks of Smithfield Ribs, and some Cola BBQ Sauce. The ribs were already thawed, so to prep, I took them out of the packaging and proceeded to remove the membrane from the bottom of the ribs (the bone side). This is supposed to help the meat fall off the bone, and absorb flavors. After your ribs are trimmed of the membrane and fat, you’ll want to crust them with a dry rub. I mixed 2 Tbsp. salt, 2 Tbsp. Brown Sugar, 2 tsp. Garlic Powder, 2 tsp. Onion Powder, 1 tsp. Chili Powder, 1 tsp. Black Pepper, and 1 tsp. Dried Onion Pieces. Wrap your rubbed ribs in foil (I used about 4 sheets per rack). Bake at 220 – meat side down – for approximate 5 hours. At this point your ribs should be cooked through, but you’ll want to put them on the grill for that authentic flavor! So, get your grill heated and throw those ribs on. Slather with BBQ sauce (I love Sweet Baby Ray’s Cola) and cook until charred as much as you like, then flip and do the same on the other side. We had a rough time getting the ribs off the grill because they were so tender … which is awesome! 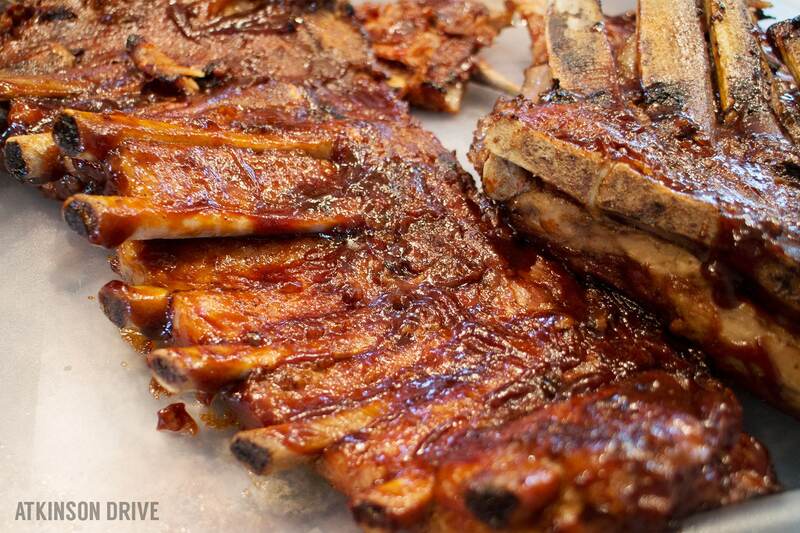 I like to serve sauce on the side because … well … isn’t the point of ribs to get messy?! These are guaranteed to be a crowd-pleaser! In fact, I would recommend you buy more ribs then you think you’ll need! And, to help with that, I have a coupon for you guys! Save $1 on Farmland Baby Back or St. Louis Style Ribs at Walmart while supplies last … visit coupons.com to clip! What is your favorite cookout tradition or recipe?